To find traveler tips, more things to do, maps, and more tourist information, read our New Delhi vacation planner. Use the Route module to see travel options from your home to New Delhi. In May, plan for daily highs up to 47°C, and evening lows to 30°C. On the 19th (Sun), you're off toNainital. Start off your visit on the 19th (Sun): explore the activities along Nainital Lake, hunt for treasures at Tibetan Market, and then learn about wildlife with up-close encounters at High Altitude Zoo. 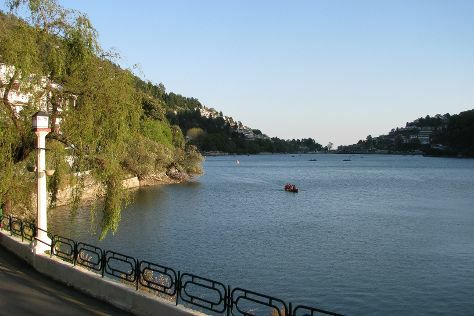 For more things to do, other places to visit, where to stay, and tourist information, read our Nainital trip itinerary tool . You can do a combination of flight and taxi from New Delhi to Nainital in 4 hours. Alternatively, you can drive; or do a combination of train and taxi. You will leave for Almora on the 20th (Mon). Almora is a municipal board and a cantonment town in the Almora district in the state of Uttarakhand, India. For other places to visit, photos, traveler tips, and other tourist information, go to the Almora trip planning tool . Getting from Nainital to Almora by car takes about 2 hours. Finish your sightseeing early on the 21st (Tue) to allow enough time to drive to Ranikhet. Ranikhet is a hill station and cantonment town in Almora district in the Indian state of Uttarakhand. Start off your visit on the 21st (Tue): take some stellar pictures from Chaubatia, then don't miss a visit to Jhula Devi Temple, then contemplate in the serene atmosphere at Binsar Mahadev Mandir, and finally tee off at Golf Ground Ranikhet. For other places to visit, reviews, ratings, and tourist information, refer to the Ranikhet planner . You can drive from Almora to Ranikhet in 2 hours. Finish up your sightseeing early on the 22nd (Wed) so you can travel to Jim Corbett National Park. On the 22nd (Wed), take in the spiritual surroundings of Durga Mandir Temple, then take an exotic tour of a safari tour, and then admire the engineering at Ramganga Dam. To see maps, other places to visit, ratings, and more tourist information, refer to the Jim Corbett National Park trip itinerary builder website . Explore your travel options from Ranikhet to Jim Corbett National Park with the Route module. Wrap up your sightseeing on the 22nd (Wed) to allow time to travel back home.